4x4 Utes: 2015 Mitsubishi Triton Exceed -Vs- Toyota Hilux SR5 — Auto Expert by John Cadogan - save thousands on your next new car! Still, every time I write a 4x4 ute review, or post a new 4x4 ute video on my YouTube channel >> it always serves as a significant reminder to me that for some, the Toyota Hilux will always be king. And, historically, you know what happens to anyone who defames the king... Some of the comments are priceless - and totally out of kilter with the facts. Toyota Hilux always leads the ute market in Australia - a testament to some degree to the vehicle's long-term sound fundamentals. More importantly, perhaps, no other carmaker has marketed 4x4 utes so aggressively or successfully as Toyota has over decades with the Hilux. Who could forget the Breaker Brothers in the 1990s and the 'unbreakable' 4x4 Hilux theme, which continues today? When it comes to the Hilux, its reputation precedes it. It is the Coca-Cola of 4x4 utes. But in many ways, as you'll see below, its reputation also exceeds it, at least currently. Hilux led the market again for the first four months of 2015. That vehicle is a powerhouse - in 4x2 and 4x4 configuration. In 4x2, Hilux achieved almost 4000 sales in the first four months of 2015, securing almost 24 per cent of the market. So, almost one in every four two-wheel-drive utes sold today is a Toyota Hilux. The Mitsubishi Triton came second in 4X2 at about 1700 sales - call it half of what Toyota Hilux manages, plus a bit. But it's 4x4 utes where all the sales action is. Toyota Hilux is ahead by a mile there, too. Almost 8000 sales in four months - call it one in five 4x4 utes. Ford's Ranger 4x4 ute came next on 6642 sales (the single successful Ford vehicle in Australia), with 4x4 Triton hot on its heels, achieving 6224 sales. The 2014 Mitsubishi Triton's success is emblematic of the price-sensitivity of this segment of the marketin particular. It was an wholly outdated product (the 2014 Triton had a four-star safety rating and a four-speed auto on most models - so one rung up from Fred Flintstone's car back in Bedrock, basically). So, when you're a carmaker, production has to equal sales - that's fundamental. If the product is as old as the hills, you slash the price. I don't know if it was profitable but there were great deals on offer during this fire sale, and Mitsubishi Triton sales went through the roof in one of the longest runout sales of all time. The new Mitsubishi Triton won't unseat the Toyota Hilux as the king - at least not in sales. Hell - it doesn't match the Holden Colorado on torque production (500Nm for the auto Colorado). Nor the 3.2-litre Ford Ranger/Mazda BT-50 (470Nm). It doesn't keep up with those three on tow capacity either (3.1 tonnes for the Mitsubishi versus 3.5 for the others). 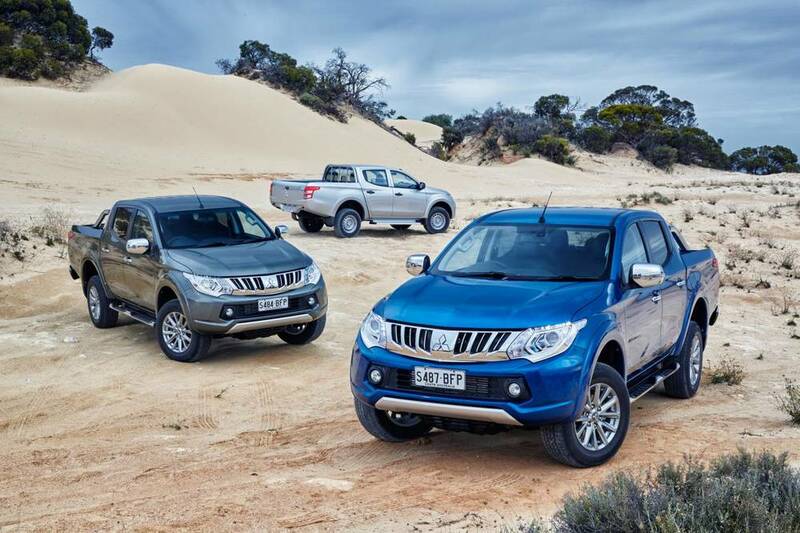 And the top trio have six-speed auto availability while the Mitsubishi Triton offers a five-speed auto. But Toyota Hilux remains the king of utes - and it's an ageing king, trading off its reputation, rather than its current prowess with the sword and the pike. In the increasingly contested niche the marketers call 'suits in utes' (where the fully-loaded model variants serve as family transport and recreational facilitator rather than actually work for a living) let's see which one you'd rather buy, today. I'm happy to hear from the Toyota fan club in the comments section below, but bear in mind, all I'm presenting below are the facts. So, let's see how this stacks up: the works burger of Mitsubishi Tritons - the Exceed, above - has more standard equipment than the Toyota Hilux SR5. A lot more standard equipment. It's got a more advanced 4WD system, too, which allows you to operate in 4WD on a high-traction surface because the centre differential can be unlocked. The price is $7000 cheaper - so if you drive past the Toyota dealership and pull in at Mitsubishi instead, that's a saving of 13 per cent right there. (You can have a lot of fun for $7000.) The Mitsubishi Triton is more powerful and delivers more peak torque. It's also 13 per cent more fuel efficient. On objective criteria at the very least, the king is dead. (And it's not only the Triton that killed it - it's a bloodbath involving the Holden Colorado, Ford Ranger, Mazda BT-50 and, to a lesser extent, the Isuzu D-MAX as well.) Usually, in this situation, the town crier's next words are: 'long live the king'. I think we'll put the town crier on ice. A new Hilux is in the wings. There are occasional reports of one in full cammo being spotted here or there globally under test, but the reality is the global reveal is thought to be scheduled for late this year, with new Hilux on sale in Australia in early 2016 at the soonest. It will be interesting to see what happens in the meantime - perception might continue to trump reality, but there will definitely be better buying for objective, rational buyers. And then, in 2016, we might have a new, authentically justifiable king. Let's wait and see if the new Toyota Hilux turns the market on its ear. Should I Buy a Nissan Navara or a Holden Colorado?